Spellbinders Shapeabilities are just one section of the very many dies that this American company produce. They cover everything from Nesting shapes to intricate lace effects. and the results on your cards can be stunning. But whenever you need a quick card then some of the Shapeabilities can really come to the rescue. There are dies that can produce clocks, fences, house shapes, cars, birds and pockets. 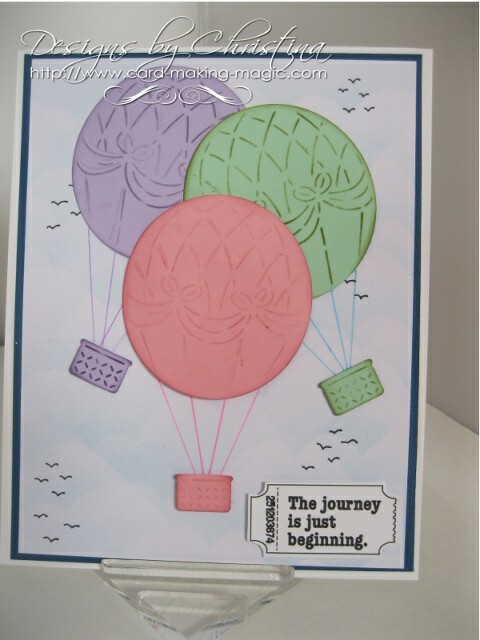 But for this card I thought I would try something a little different with balloons and banners. There are some lovely Accents and Motifs sets available too and they help you to make beautiful cards ... and I always like to buy the Accents and Motifs that match each other. Some of these are "Close Out" dies which means they are no longer being produced by Spellbinders. You may have to shop around for them now but they can be found it you look hard. Spellbinder Bargains ... and I have never met a Spellbinder yet that I don't like. The two cards here show some of the items from just one set and that is called Up, Up and Away. 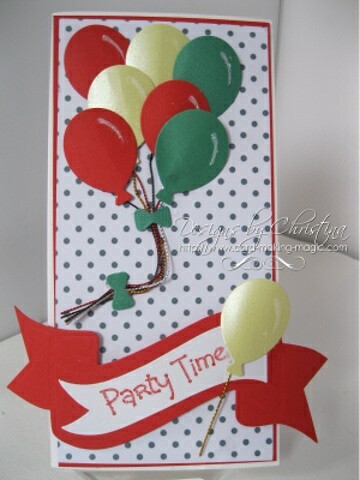 I have used the small balloons from the set and created a party theme card. And because there are no sharp cutting edges to the dies they are a safe option for children to use. That would be a really good card for your children to make and give to their friends for a birthday invitation. This second one would be good for someone setting out on their travels or maybe just starting a new adventure in their lives. Both these cards are quick and easy to make and can use up some of those scraps that we all have in a box. Let the video show you how to make the second card and then you can add any sentiment to it that suits your recipient.